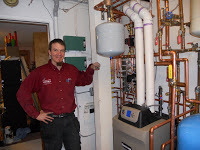 With temperatures dropping to minus 10 degrees F at night in Anchorage, Alaska, the installation of Camai Bed and Breakfast’s Weil MacLain ultra energy efficient boiler was done this past week. The plumbers, Rich and Dustin, arrived from Moore Plumbing and Heating ready to do the first day’s work for the installation on Thursday. A snag with the venting was almost immediately discovered. With the more than fourteen major remodels to the B&B that have been done, the pipe from the boiler at the lowest floor up to the top floor some 2 ½ floors up was not a straight length. There were elbows. 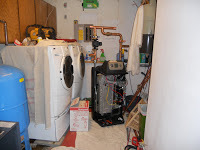 The new energy efficient boiler required special intake and exhaust pipes. Day one ended without the usual work being completed. Day two brought the simplest solution. Only two different levels would have to have cuts in the sheet rock to access the pipes. One was on the top floor in our area. The other was in the kitchen’s pantry. Fortunately, neither one would effect our bed and breakfast guests. The two plumbers arrived early Friday morning and worked at the getting the intake and exhaust pipes installed by mid-afternoon. 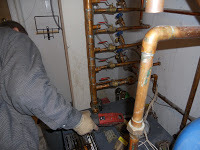 Meanwhile the old boiler and the recently discovered broken water heater were removed. Late in the afternoon the new installation began. The plumbers worked until beyond midnight to get heat in the house. When they left, we had heat which was on and would not go off. Everyone was thankful for the heat since we had been without since early in the morning. Day three only Dustin returned to wire the zone valves. He worked until 9 that night. He thought it was working; however, it needed trouble-shooting. A third plumber, Roy, came to do that. Roy left before 10 PM and declared that all looked good. When we awoke this morning with our bedroom’s temperature at 86 degrees, we knew they switched at least one of the zone valves. Roy returned. It seems to be fixed. This was a major project which we have needed for several years. It is good to have the high efficiency boiler. We look forward to using less energy while staying warm in the winter.